Safenames Review 2019: Is Safenames a Good Hosting? A solid infrastructure and services custom-made for your needs are what you can expect with U.K.-based hosting provider Safenames. Safenames is primarily a domain registration company, but has also extended their portfolio of services to include different kinds of hosting including cloud servers, dedicated servers, and colocation. Founded in 1997, they’re headquartered in the U.K. but have offices all over the globe. 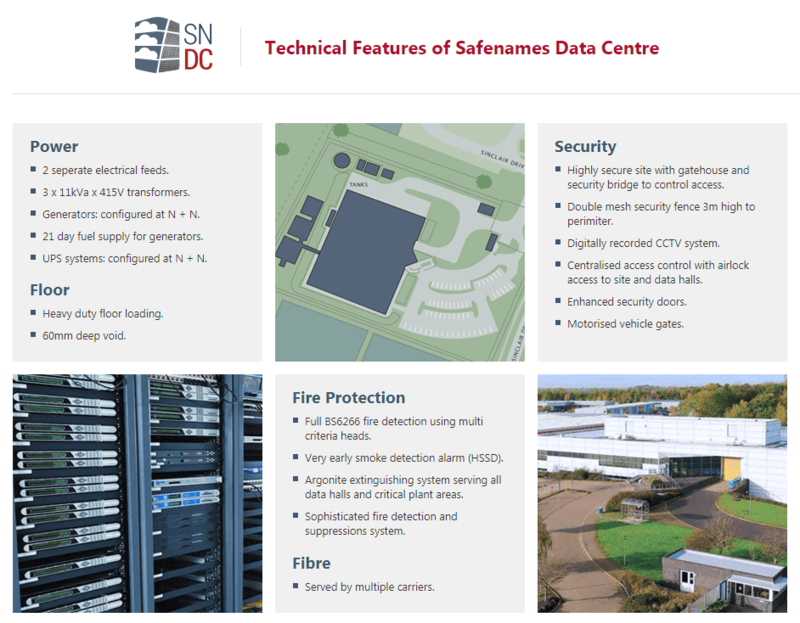 Safenames offers cloud server and dedicated server hosting, so their solutions are more appropriate for companies with complex needs or enterprise-scale operations rather than individuals looking to carve out a basic online presence. Their dedicated hosting services are primarily for customers that have online businesses and receive a lot of traffic and frequently process online payments. Their end-to-end solutions target medium to large-sized organizations, providing them with solutions built on reliable infrastructure. Most of the hardware used in the setup of their servers come from renowned companies like IBM, Dell and Compaq. Both Windows and Linux operating systems are available with their dedicated hosting services. Applications running on MSSQL, MySQL and PostgreSQL can easily be run on their systems. Excellent server monitoring protocols ensure all the hardware and necessary protective measures are in place, achieving an average 99.9999% uptime. Server backups are always available and users can easily restore their website to a previous state. Since they operate their own Tier 3 data center, they have the ability to accommodate all sorts of customer requirements. This includes scaling up in the future if your business takes off. As long as you can tell them what your exact requirements are, they will happily make the resources available. Safenames doesn’t offer any packages for you to choose from. Rather, you have to get in touch with them with your exact requirements and ask for a quote. They only list the minimum prices their services would cost and while that isn’t a clear indicator of their pricing structure, it does confirm that they’re neither a budget hosting service nor an overly expensive option. They’ve got excellent SLAs in place as well, and they have the capability to fulfill any type of business requirements around the world. Getting in touch with them is easy. They have local telephone numbers and email addresses for each of the countries they’re present in. However, they don’t provide any live chat, and they only promise to get back to you within three days. That’s a lot of time considering today’s standards. However, when I sent them an email asking about their pricing structures, they replied within a few hours despite it being the weekend. In short, Safenames is a reliable, enterprise-grade hosting provider with bespoke solutions for businesses of all kinds. With them, you only pay for the resources and features you’ll actually use, rather than going with a pre-made package that affords you lots of stuff that you’ll never end up needing. Wondering how Safenames stacks up against other Web Hosting companies? Enter any other Web Hosting company and we will give you a side-by-side comparison.